The gunner's knowledge of his machine gun is not complete until he learns something of the action and effect of the projectiles when fired. This section discusses various characteristics of machine gun fire, including trajectory, cone of fire, and the beaten zone. a. Trajectory. 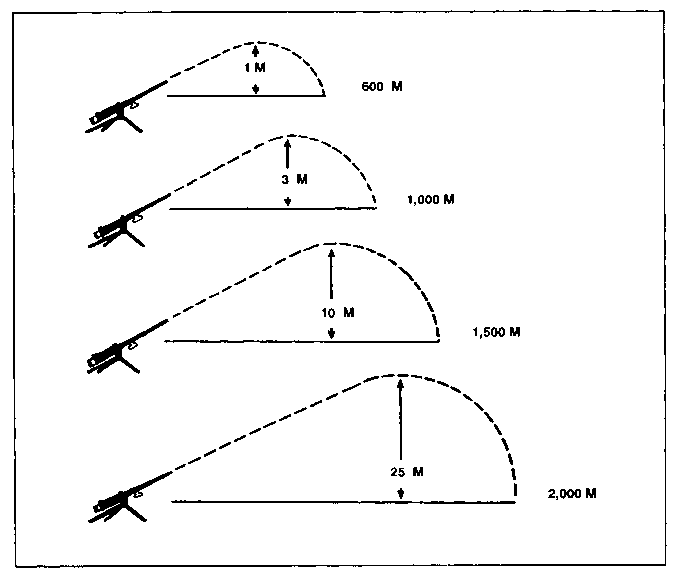 The trajectory is the curved path of the projectile in its flight from the muzzle of the weapon to its impact. The major factors that influence the trajectory are the velocity of the round, gravity, rotation of the round, and resistance of the air. The farther the round travels, the greater the curve of the trajectory. The highest point of the trajectory is called the maximum ordinate. This is a point approximately two-thirds of the distance from the gun to the target. The maximum ordinate increases as the range increases (Figure 6-1). the distance from the gun to the target. The maximum ordinate increases as the range increases (Figure 6-1). Figure 6-1. Maximum ordinates at key ranges. b. Cone of Fire. When the weapon is fired automatically in bursts, all the rounds do not follow the same path. This is due to the vibrations of the gun and mount, variations in ammunition, and atmospheric conditions, which cause the rounds to follow a slightly different trajectory. This group of trajectories formed by a single burst is called the cone of fire (Figure 6-2). Figure 6-2. Cone of fire. c. Beaten Zone. The beaten zone is an elliptical pattern formed by the cone of fire as it strikes the ground. The beaten zone is always about 2 meters in width. (1) Effect of range. As the range to the target increases, the beaten zone becomes shorter and wider. (2) Effect of terrain. The length of the beaten zone for any given range will vary according to the slope of the ground. On rising ground, the beaten zone becomes shorter but remains the same width. On ground that slopes away from the gun, the beaten zone becomes longer but remains the same width. 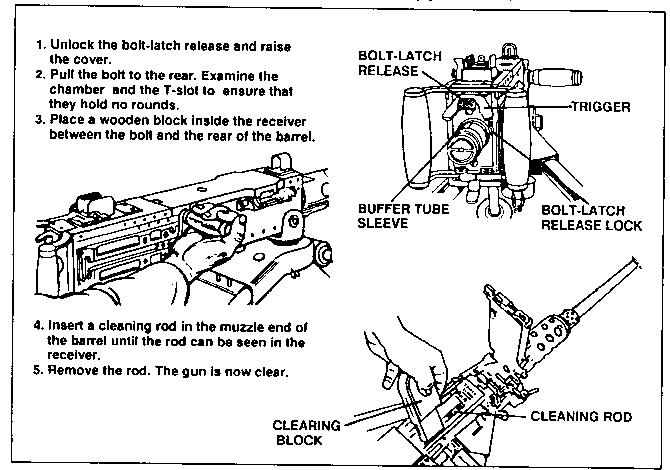 Machine gun fire is classified with respect to the ground (Figure 6-3, page 6-4), the target (Figure 6-4, page 6-5), and the gun (Figure 6-5, page 6-7). a. Classes of Fire with Respect to the Ground. (1) Plunging fire. Fire in which the angle of fall of the rounds (with reference to the slope of the ground) is such that the danger space is confined to the beaten zone, and the length of the beaten zone is materially shortened. Plunging fire is obtained when firing from high ground to low ground, when firing from low ground to high ground, and when firing at long ranges. (2) Grazing fire. Grazing fire is fire in which the center of the cone of fire does not rise more than one meter above the ground. 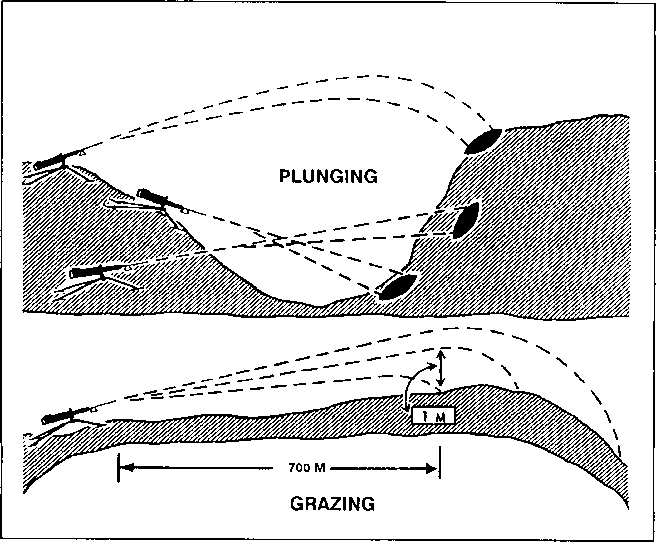 When firing over level or uniformly sloping terrain, the maximum extent of grazing fire obtainable is about 700 meters. Figure 6-3. Classes of fire with respect to the ground. b. Classes of Fire with Respect to the Target. (1) Frontal. The long axis of the beaten zone is at a right angle to the long axis of the target. (2) Flanking. Fire is delivered against the flank of a target. 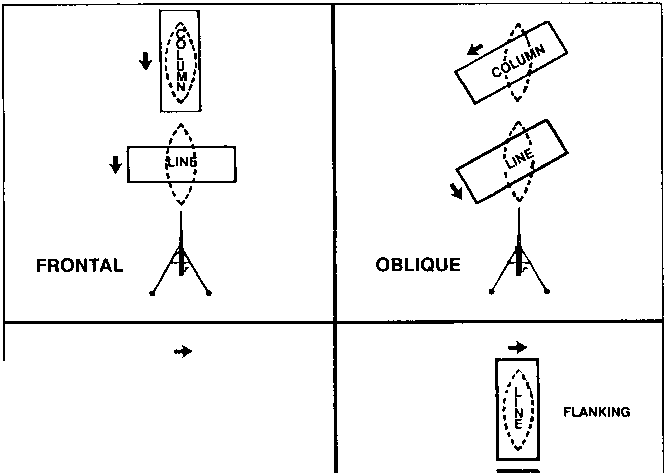 (3) Oblique. The long axis of the beaten zone is at an angle (but not a right angle) to the long axis of the target. (4) Enfilade. The long axis of the beaten zone coincides or nearly coincides with the long axis of the target. This class of fire is either frontal or flanking. It is the most desirable class of fire with respect to the target because it makes maximum use of the beaten zone.